Stems: Stems erect, much-branched from middle. Plants monoecious; herbage gray-green or light yellow-green, sparsely to moderately stellate-pubescent. Leaves: Alternate; stipules present, inconspicuous, often early-deciduous: petiole 1/8 to 4/5 inch; blades broadly ovate to lanceolate, oblong, or elliptic, .4 to 1.4 inch long, .2 to 1 inch wide, base rounded or truncate, margins entire, tip rounded to acute. Inflorescences: Spikes, terminal and axillary, .4 to 1.2 inch; staminate and pistillate flowers in same spike. Flowers: Staminate flowers: sepals 3 to 5, triangular to oblong, less than 1/25 inch; petals 3 to 5, elliptic to oblanceolate, less than 1/25 inch; stamens 3 to 5. Pistillate flowers: sepals 5, elliptic to linear, 1/16 to 1/12 inch; petals 0; styles 2, each divided 2 times, ultimate segments 4. Fruits: Capsules, dehiscent, 1-seeded, not concealed by persistent calyx, ovoid, 1/7 to 1/5 inch; seeds gray, brown, or mottled, globose, 1/10 to 1/7 inch. 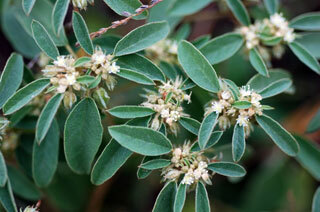 Uses: A mild tea can be made by steeping the leaves, hence the common name, prairie tea. Comments: Croton, tick, alluding to shape of the seeds and monanthogynus, one + female + flower.